"Justin Lewis is one of the world's most acute observers of contemporary cultural politics. 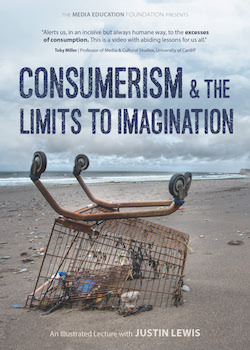 Consumerism & the Limits to Imagination alerts us, in an incisive but always humane way, to the excesses of consumption. This is a video with abiding lessons for us all." "Lewis provides viewers with a trenchant and timely critique of the dominant social system of our time, showing how consumer capitalism undermines the well-being of humans and the planet. I found particularly fascinating and provocative his insights about the ways that media and marketing undermine our collective ability to imagine alternatives to this damaging way of living." "This is an outstanding video that captures, in vivid and compelling ways, the curse of consumer capitalism. It combines images that will stay with you with a keen analysis of the issues we all face. Ask family or friends to get together and watch it to -- and we all be richer, I mean better, for it." "The idea and practice of indefinite economic growth fuel the current destroying of our planet. Consumer capitalism and its cultural institutions shape citizens that incessantly long for cheaper and more consumer products, while citizens are not becoming happier. Engaging lectures and films like this is precisely what is needed to save our capabilities to envision more sustainable futures that also bring real quality of life. Justin Lewis shoots bull's eye in his review of this fundamental and very difficult issue."